A radio ad released this week urges Greater Vancouver residents to ask their government to protect BC’s pristine north coast with a permanent tanker ban. Featuring the sounds of orcas, seabirds and wild salmon, the ad juxtaposes the lively sounds of BC’s wild coast against the eerie sound of silence that would come if an oil spill were to occur. It’s the latest development in a ForestEthics campaign asking British Columbians to call on their local Members of Parliament for a permanent tanker ban from BC’s pristine north coast. The ad, which directs listeners to petitions on TarSandsFreeCoast.ca, will run on radio stations around Vancouver over the next month. 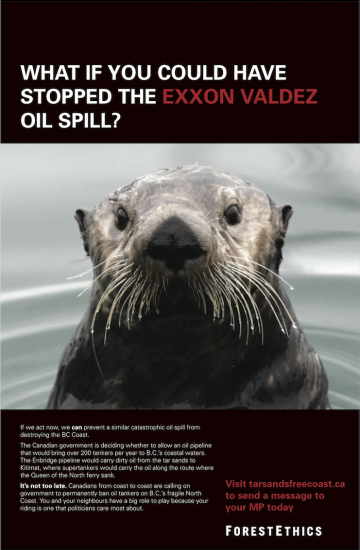 “Do we want our rich coastal wildlife silenced by an oil spill? 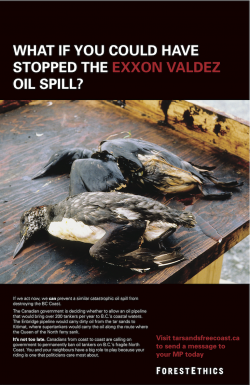 It’s a sobering reminder of how much we stand to lose if our government allows oil tankers into our northern waters,” said Jolan Bailey, Climate Outreach Coordinator for ForestEthics. The federal government is considering a proposal for the controversial Enbridge pipeline project that would bring more than 200 oil tankers to BC’s north coast each year. The project faces strong opposition across BC – including a tanker ban announced by Coastal First Nations in March. Polls also show that 7 out of 10 British Columbians already oppose tanker traffic in BC’s northern waters. The Federal Liberal Party has recently stated that they support enacting the existing moratorium on oil tanker traffic, but they are not as interested in a permanent ban. British Columbians have made it clear that we want to keep the north coast oil-tanker free. Now it’s time for all federal parties to show leadership by securing a permanent tanker ban.